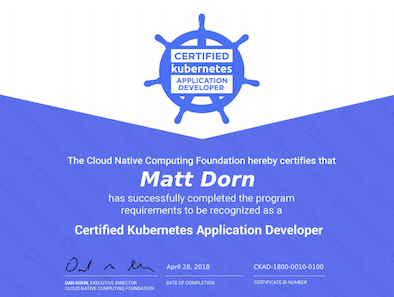 In case you didn't notice, the Cloud Native Computing Foundation recently dropped another Kubernetes exam called the Certified Kubernetes Application Developer (CKAD). I took the exam a few weeks ago and thought it was pretty good. Unlike the Certified Kubernetes Administrator Exam (CKA), the CKAD only focuses on the Developer persona. This makes the CKAD much easier than the CKA but keep in mind you only have two hours to complete all tasks. The CNCF has updated their open-book policy for both CKA and CKAD. You are only permitted to open one additional web browser tab to access official documentation at kubernetes.io during the exam. No other websites are permitted. The objectives for the CKAD can be found throughout the Official Certified Kubernetes Application Developer Exam Curriculum. The exam environment is the exact same as the CKA and described in my last post. Have fun preparing and taking the Certified Kubernetes Developer Exam! Check out the CNCF's FAQ for additional info.